There are some furniture pieces that stand the test of time: the Eames chair, the Louis Ghost Chair, a solid oak Welsh dresser and the Chesterfield sofa to name just a few. The latter was a piece I grew up with; dark burgundy leather with deep buttons and firm sides. It sat in my parent's living room from long before I was born until many years later and lasted the antics of two children and various pets. Hard wearing and beautifully made. Chesterfield sofas are a traditional British icon, a vintage style treasure but where did they originate? Long associated with gentleman's clubs, of rich aristocrats sat conversing over a brandy and business deals being made. One of the thoughts around the sofa's origin is a story around the 4th Earl of Chesterfield, Philip Dormer Stanhope (1694-1773). It is thought that the Earl, a man of great taste, requested a chair to be made with a low seat, firm sides, arms and back of the same height and one which would not cause men's clothes to crease. The final chair was made into what we know today as the design icon with the deep set buttons, the Chesterfield!There is no evidence to substantiate this but it could very well be a true tale as after all there are usually some grains of truth in folklore. These elegant chairs once graced just the stately homes and clubs of the wealthy but in modern times, the superbly crafted sofas are a home design item for all to enjoy. I love the classic feel of them but with some modern twists, so perhaps some bright cushions mixed in with an English heritage feel. With many colours available and the option of using a bright velvet or fabric, a true statement piece could be created for your home. The Chesterfield is such a traditional design, sophisticated, it is always in fashion and suits all types of home. Even a modern house build suits one, especially with the range of options available for bespoke pieces. The Original Sofa Co. Ltd specialise in Chesterfield sofas and chairs using long-established techniques and craft a large variety using a solid beechwood frame. You can then select the fabric or leather colour, or even choose a pre-loved restored Chesterfield which would be my choice for my front room. 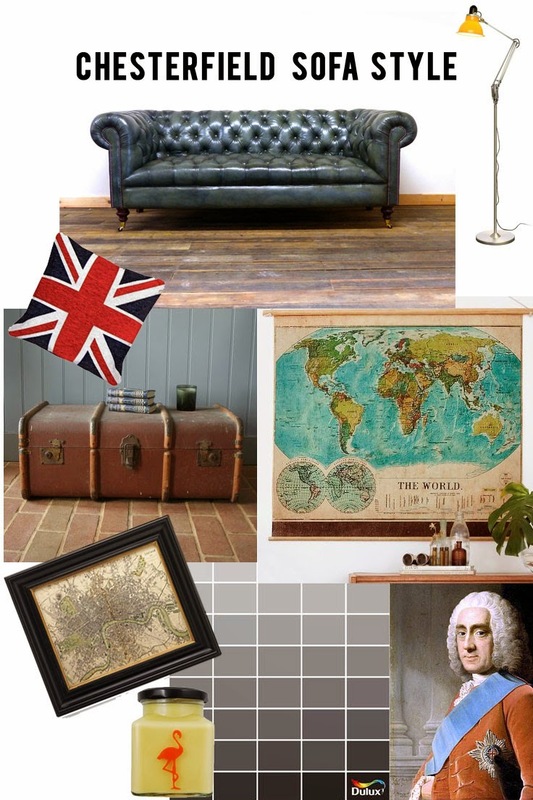 A classy burnt tan finish with brass castors and turned legs would go so well with my vintage maps, grey feature wall and old steamer trunk and of course some Union Jack cushions in recognition of this quintessentially English piece of furniture. Have you ever had a Chesterfield sofa? How would you style yours?